LONG BEACH, Calif., Dec. 20, 2017 /PRNewswire-USNewswire/ -- There was something different about the pediatric playroom at MemorialCare Miller Children's & Women's Hospital Long Beach on Tuesday, Dec. 12. It was the sound of POWER 106 and KDAY 93.5 DJ's playing the latest hits and holiday favorites. Executives from MemorialCare Miller Children’s & Women’s Hospital Long Beach accepted a $20,000 donation from Liset and Alex Meruelo, of the Meruelo group, to support the Music Therapy Program. 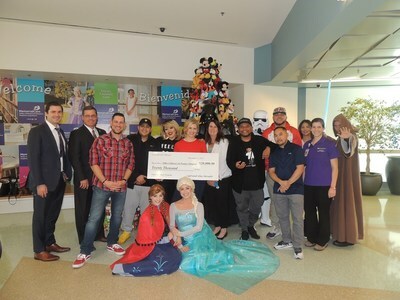 Power 106 personality, J Cruz, was joined by Frozen characters, Elsa and Ana, as they brought the pediatric playroom at Miller Children’s & Women’s to life with music. 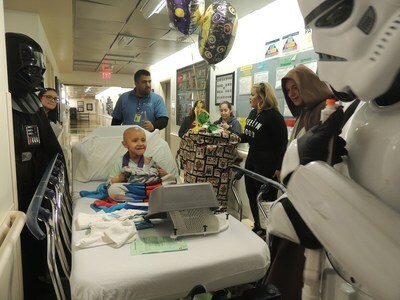 The halls of Miller Children’s & Women’s were filled with joy and laughter as Star Wars characters surprised patients with plush toys as part of the 20th annual Bear Hugs Toy Drive. The unique music party was part of the Bear Hugs Toy Drive donation, an event launched by Liset Meruelo, wife of prominent Cuban-American businessman Alex Meruelo, of the Meruelo Group. Now in its 20th year, Bear Hugs Toy Drive delivers hundreds of bears and stuffed animals to patients at Miller Children's & Women's. 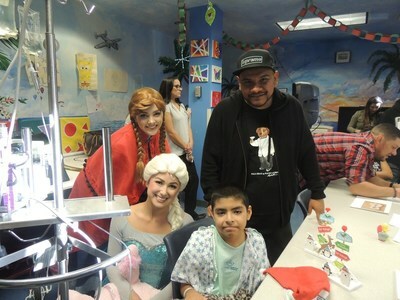 This year, Liset was joined by prominent Los Angeles radio personalities J Cruz, Jeff Garcia, DJ E-Man and Cece The Mamacita, as well as Star Wars and Frozen characters, like Elsa and Anna whose voices filled the halls with holiday cheer. Throughout the holiday season, Meruelo Group employees, families and friends, including Meruelo Group companies POWER 106 and KDAY 93.5, gather donations. "The small donation of a plush toy provides these children and their families with a moment of happiness and smiles," says Liset Meruelo. "As a parent, you'd want to look forward to anything that can get your child's mind off their illness and treatments and just be a kid during the holidays." Liset and Alex Meruelo are longtime supporters of Miller Children's & Women's. In addition to bringing a day of holiday fun and music to patients, the Meruelo's donated $20,000 to support the Music Therapy Program at Miller Children's & Women's. This is their third donation to the Music Therapy Program. Their donation in 2016 helped expand the Music Therapy Program, including the addition of recording software, which has allowed patients the opportunity to record their own music. "Music is often the only way that our patients feel comfortable expressing themselves," says Andrea Chattler, music therapist, Miller Children's & Women's. "Being able to have them go through the process of writing down their feelings, recording, mixing and editing their own songs is therapeutic. It gives many of our patients an outlet to address feelings about their illness." The Music Therapy Program is part of the Child Life Program at Miller Children's & Women's, which was developed to help make the hospital experience more positive for children. "The Bear Hugs Toy Drive is a great way to bring our patients comfort and the opportunity to forget their illness for one day, but through their generous donation, we will be able to provide support to our patients well beyond the event," says Rita Goshert, manager, Child Life Program.